One of the hardest parts about getting a new fence is understanding the unfamiliar terms and concepts fence contractors use. If you’re unfamiliar with fencing and DIY terms, reading about them can be like learning a new language. To help, we’ve put together a short guide on the different parts and pieces of a vinyl fence and how they all fit together to make a quality, long-lasting product. The first part of a fence to know is the fence post. Fence posts are the thick, upright posts which hold the rest of the fence together. Though we tend to ignore them, fence posts are the structural base of the entire fence – you can think of them like the fence’s foundation. Because of their importance, it’s vital you or your contractor uses quality fence posts and installs them properly. Line posts: Standard fence posts, spaced regularly along the fence line. Line posts support fence panels or rails on each side. Corner posts: A post at the corner of where two sections of fencing fence panels or rails meet, usually at a 90-degree angle. End posts: A post that marks the end of a fence line, such as where the fence supports a gate or runs up against a house. Terminal posts: A load-bearing post for the fence line. Terminal posts can be corner, end or gate posts. Gate posts: A post to which a gate is attached with either hinges or latches. It’s common to think of panels or pickets as the “main” part of a fence. These pieces form the “wall” of the fence which keeps out intruders, blocks sight lines and provides shade and shelter for your property. Though they are similar, panels, pickets and rails are all distinct pieces of a fence and it’s important to understand them all. Rails: Rails are the horizontal part of a fence that hold the pickets or panels in place. Many vinyl fences have two rails, one at the top and one at the bottom. However, it’s not uncommon to see many fences with three rails: top, bottom, and center. The distance between the rails is known as the rail spacing. Pickets: Pickets are the vertical boards held up by the rails. They form the wall of the fence. Pickets can be arranged on the rails in many ways to allow for different levels of visibility through the fence. There are also different sizes of pickets available for vinyl fences which allow you to create different looks for your fence. Pickets can also be joined together (tongue-and-groove pickets) for complete privacy or spaced apart to allow for some visibility through the fence. 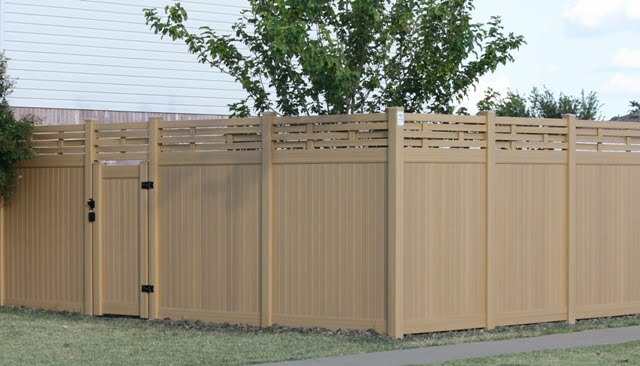 Panels: Some big-box stores offer pre-assembled vinyl fence panels, but they are not as strong or well-built as custom fences. For a custom fence, the panel is simply the arrangement of pickets and rails between each post. Post Caps: Post caps are decorative accents for your fence that are placed on top of the fence posts. Post caps can be made in many different styles, and can even have solar or low-voltage lights built in for a decorative effect or for pathway lighting. We offer a variety of post cap styles so you can achieve the look and design you want. Gates and Gate Hardware: No fence is complete without a gate. There are many different types and styles of gates to choose from, including solid gates, gates with decorative inserts (which can also be used for visibility through the gate itself), and even motorized driveway gates to fully enclose your property. Gates are also available with standard latches or latches that can be keyed to your house key. One of the best things about vinyl fence is how customizable it is. The parts and pieces of vinyl fences come in a huge array of colors and styles, and they can be combined in almost any way to create the exact look you want. If you’re ready to start your vinyl fence project, contact Future Outdoors today. We’re the number one installer of vinyl fences and vinyl products in the DFW metro, and we’re ready to make your fence project a reality. Call (972) 576-1600 today to learn more, or visit our Facebook page to see completed projects and reviews from satisfied customers.